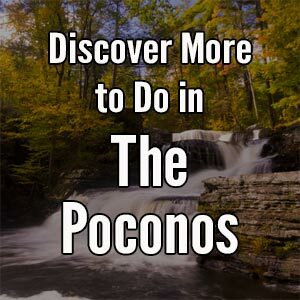 The Poconos is well known as one of Pennsylvania’s best outdoor destinations. 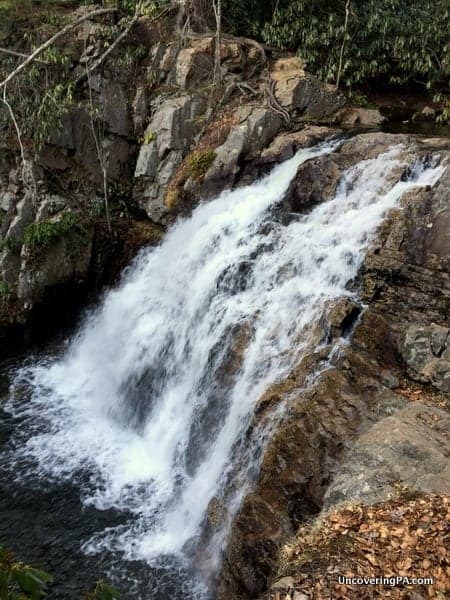 And, outdoor enthusiasts flock to the Delaware Water Gap and Glen Okono near Jim Thorpe to see some of the best waterfalls around. However, for those looking for a bit more off the radar destinations, there are many great choices. 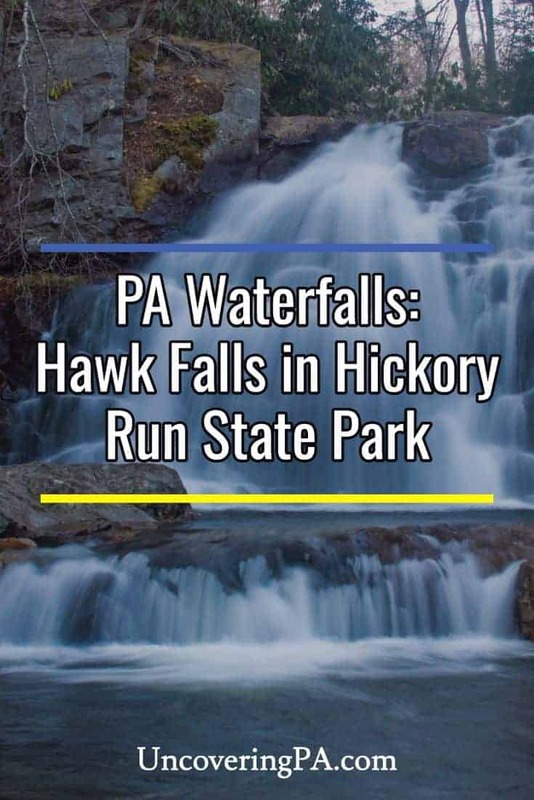 One of those is Hawk Falls in Hickory Run State Park. 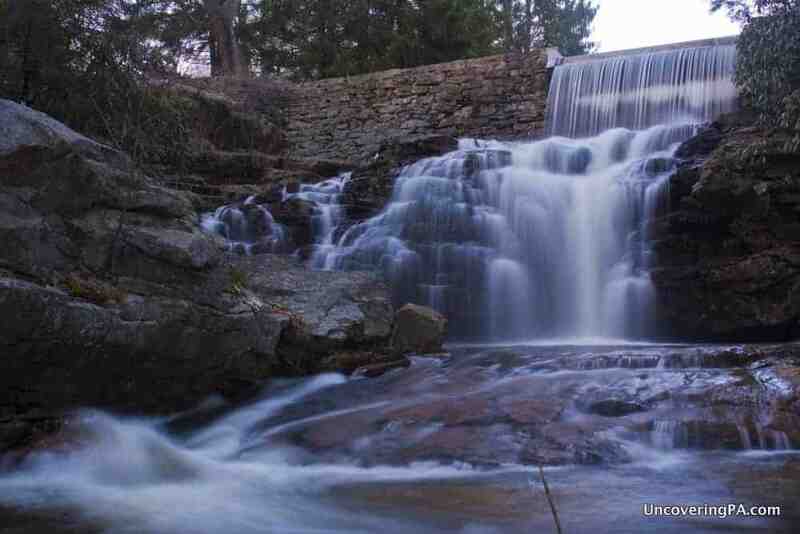 Hawk Falls is a 25-foot tall waterfall along Hawk Run in the southeastern corner of the park. The waterfall is actually located fairly close to Interstate 476 (you can even see a large bridge from the top of the falls), but it’s fortunately far enough away that the sound of traffic doesn’t impair the serenity of the area. The I-476 bridge (top left) is visible from the top of Hawk Falls (bottom right), but you fortunately can’t hear the road. The hike to Hawk Falls is about half a mile and passes through a beautiful forest full of towering trees and beautiful rhododendron. And, while the hike is mostly downhill, it’s not a difficult hike by any means. According to the park’s website, the stream is named for the Hawk family that used to own a farm across from the parking area. The trail itself was once used by wagons to go from Mauch Chunk (now Jim Thorpe) to points north. Looking upstream at Hawk Falls during the winter. 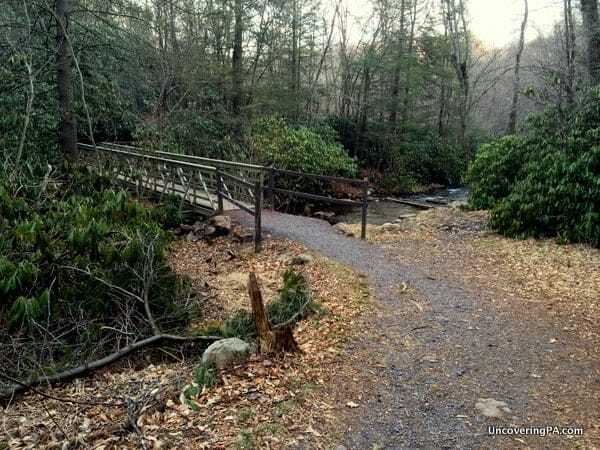 About two-thirds of the way through the hike, you’ll cross a beautiful wooden bridge over Hawk Run. After crossing the stream, head downhill a bit further until you hear the waterfall. At this point, you won’t be able to see the falls, but you should see a small clearing with a rock outcropping on your right. Head about 20 feet off trail, and the waterfall will come into view. This beautiful wooden bridge crosses Hawk Run a few hundred yards upstream from Hawk Falls. The rock outcropping near the top of the waterfall gives you a great view of the waterfall, as well as the area where Hawk Run flows into Mud Run, just a few hundred feet downstream. Be careful when moving around on the rocks, as they can be very slippery, especially when wet. If you want to see Hawk Falls from the bottom, return to the trail and continue following it until you come to Mud Run. Just before the stream, you’ll notice a well-worn path that heads off to your right and into the woods. While unmarked, this is the path that you need to take to reach the bottom of Hawk Falls. The view of Hawk Falls from the rocks at the top of the waterfall. From the bottom, the true beauty and size of Hawk Falls is evident, so I’d suggest taking this short diversion to see another view of the waterfall. 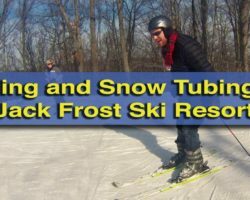 For those looking for more things to do in Hickory Run State Park, there are several other options. I was hoping to check out the boulder field, which is Hickory Run’s most well-known feature, as well as the fire tower, but ran out of daylight. If you have a chance to visit them, make sure to take it. I know I’m looking forward to visiting again so I can visit these areas. Also worth checking out is the section of Hickory Run below Saylorsville Dam. Below the dam are two very scenic waterfalls that aren’t on the park map. While one of them is partially man-made, visiting them is well worth your time. The half man-made, half natural waterfall below Saylorsville Dam. Overall, I was really impressed with Hawk Falls, and all of Hickory Run State Park for that matter. 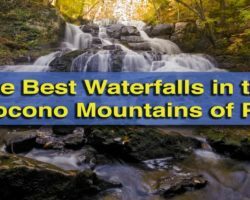 If you love PA waterfalls as much as I do, definitely add this one to your must-see list, and then save some time to visit the rest of this great state park. 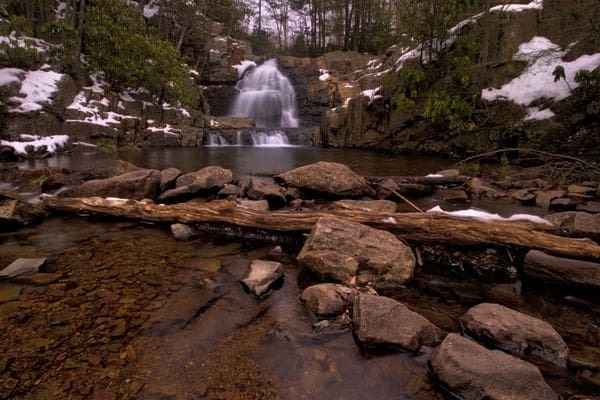 Hawk Falls is located in the 16,000 acres of Hickory Run State Park in Carbon County, just north of Jim Thorpe, PA. Because of its size, you’ll definitely need to pick up a map before visiting or check out the online map of the park. This isn’t a waterfall that you can easily find if you just show up to the park with no idea of where to go. However, if you know where the waterfall is, it’s quite easy to find. Parking for Hawk Falls is located along Route 534, just east of I-476. In fact, you can see the bridge that carries 476 over 534 from the parking area. When you arrive at the parking area, you’ll notice that there are places to park on both sides of the road. The trailhead is on the southern side of the road, so it makes sense to park there if there is room. The parking area can be found at the following coordinates: 41.010731, -75.633967. The trailhead for the Hawk Falls Trail is located about a hundred feet up the road from the parking area. 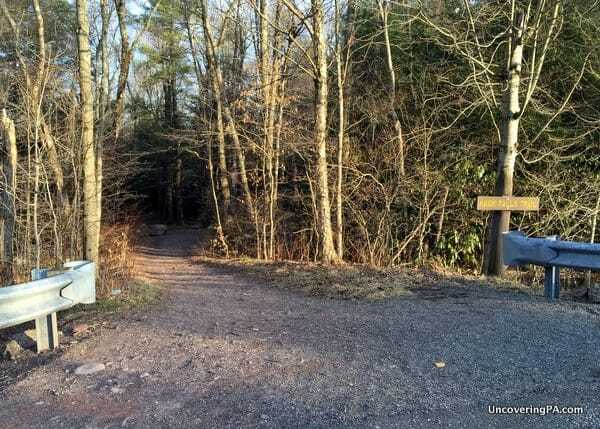 After parking, the trailhead is located about 100 feet up the road towards the highway overpass. Once on the trail, finding Hawk Falls is quite easy. 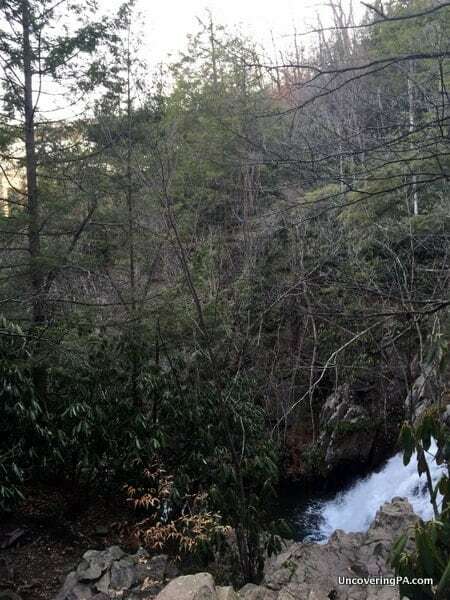 As I stated above, you can’t see the waterfall from the trail, but you are close enough to easily hear it, and the trails to the top and the bottom of the falls are easy to find even if they aren’t marked. 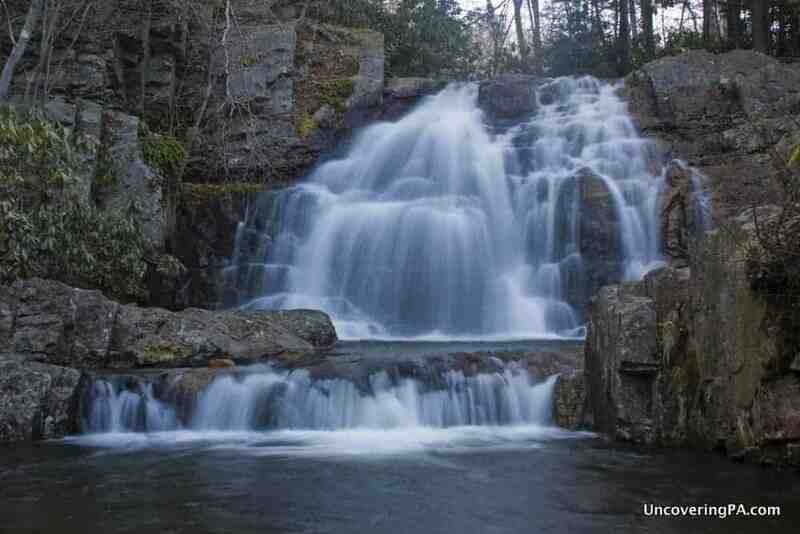 For those that are interested, the waterfall is located at the following approximate coordinates: 41.006320, -75.633958. All told, the trail is about half a mile from the parking area to the top of Hawk Falls. 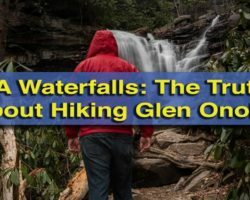 Without a doubt, this hike is worth it to see one of the best waterfalls in the Pocono Mountains. 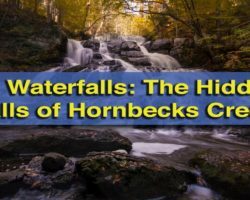 If you’re looking for other nearby waterfalls, don’t miss Tobyhanna Falls, Glen Onoko, and Wild Creek Falls. Hawk Falls is beautiful in all seasons. We have pictures on our wall of the falls in the spring after the snow melt and in the winter with the snow and ice. It is quite a beautiful site and well worth the hike down there. Best pictures are taken from the bottom. Your directions were superb. This location was not “off the radar”, however. We were hoping for a romantic quiet hike. What we found were crowds of people. There was trash, graffiti, and dog poop on the trail. Such a shame that people have to be such dirty animals. The falls were beautiful, but we left there feeling sad and disgusted. That’s too bad, Annette. When I visited, I don’t recall seeing any of that, and I know I would have noticed graffiti. It’s a shame people can’t take care of this beautiful places. The trash and graffiti is a shame to hear about. Humans are the only dirty animals out there but we can also help change that as well. If you would like to help clean up the area and bring as many people to help as you can, we can make a change in this world. You can contact me at [email protected] if you have any questions or need help with a plan of action. Many years ago we camped at a carry-in site on Mud Run. Very pretty and romantic place. I don’t know if the site is still there. I swam in Mud Run (which by the way was crystal clear) with some very large trout. And the water was about the coldest I ever swam in. Question?!?!? I have been to Glen Onoco but i am truly baffled that I have never been here. I work for a magazine and they are looking to do a waterfall shoot. Do you think it would be safe enough to do a photoshoot there with the adults? also, how long does it take to get to the falls from the entrance? Thanks so much! Beautiful pics!! This is a very difficult hike. The main waterfalls probably wouldn’t be great for a photoshoot, though because there are often a lot of people here. Is it safe to swim at the bottom of the falls? Swimming is not allowed at Hawk Falls per the rules of the state park.